My two boxes from Fabric.com arrived a while ago, so I can finally write the second part of this review! The first part was very negative and talked about my experiences with customer service, and the actual ordering process from Fabric.com. This will be a proper review of some of the products and surprisingly, it will be positive. I made two orders from Fabric.com. Order one was placed on March second, shipped out on March fifth, and arrived on March Tenth. Order two was made on March fifth, shipped out on March tenth, and arrived on March twelfth. They have slow processing times, but the shipping was super speedy. 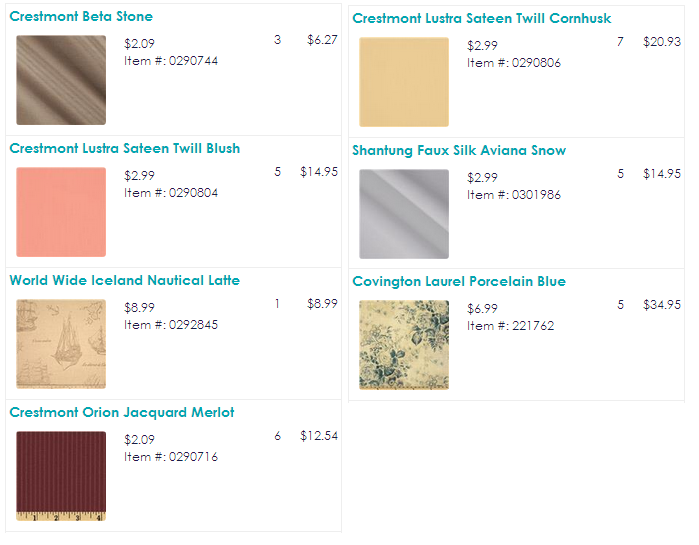 This is what my orders looked like – I got over thirty yards of material for a bit more then one hundred dollars. I took advantage of some really amazing sales, unfortunately most of them are no longer available. I’m not sure if the low prices were a fluke, but now all of these are only 20% off instead of half price. 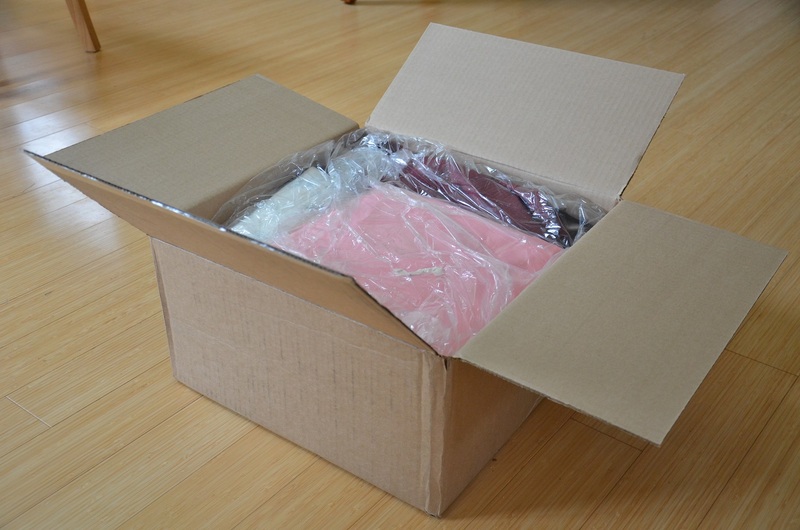 My order arrived in two boxes – the first weighed thirteen pounds! The second one was only seven pounds, much less impressive, but my dog found it interesting. 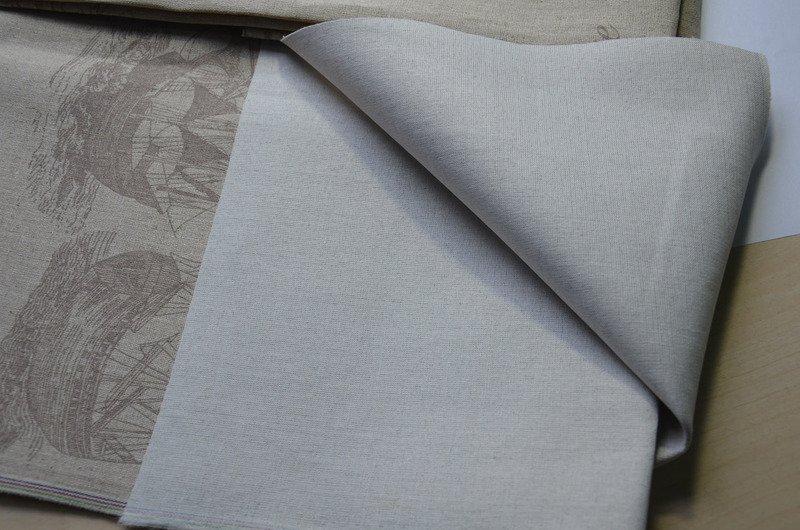 The fabric that originally tempted me into ordering was the cornhusk colored twill – well I originally ordered shantung, it was out of stock, had to reorder it in twill. For some reason I thought this fabric would match some other material I had. I’m not sure why I was so confident about that, since the photo on the site is much darker then the material I wanted it to match. But I bought seven yards of it. And in person it looks like this. To be honest it looks nothing like the photo. 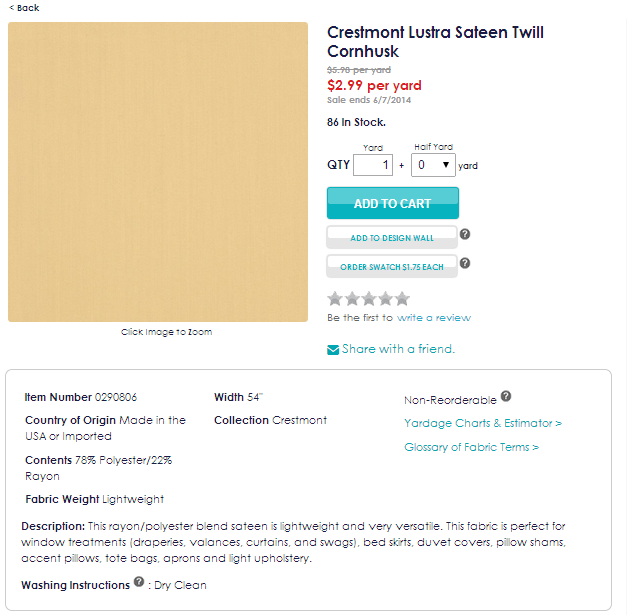 It matches the name though – it’s a beige-y yellow that looks like a dried cornhusk. 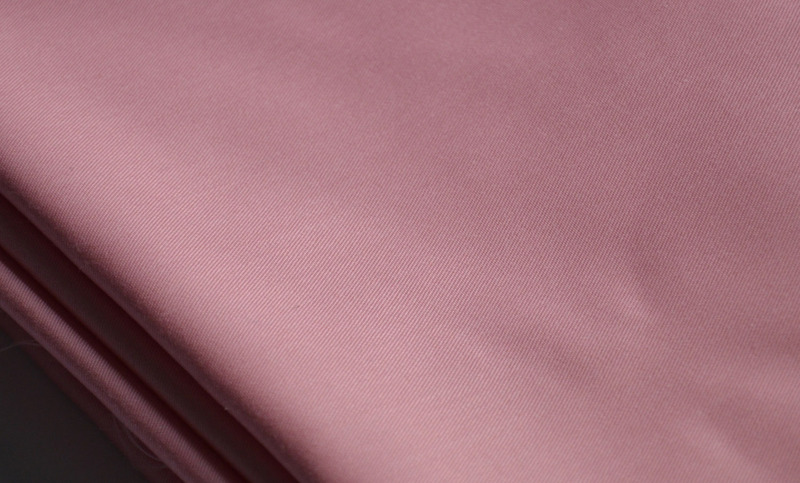 The material itself is a decent weight twill, with a really nice sheen to it. 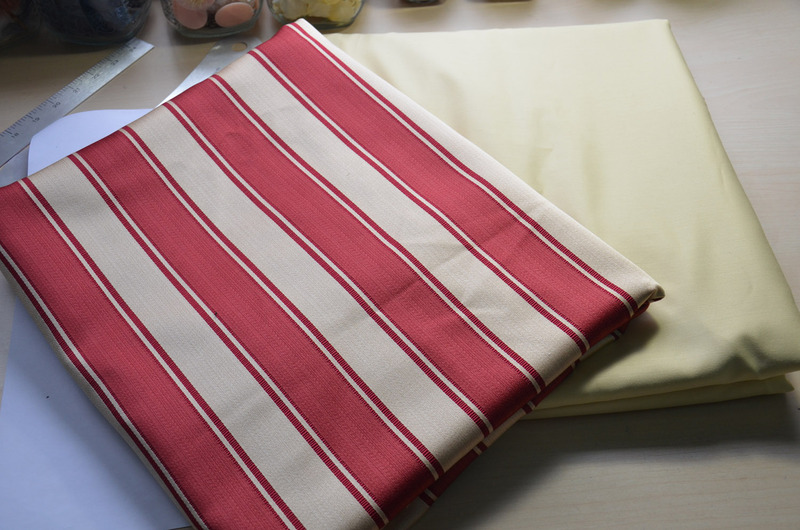 And by some miracle – it matches my other fabric perfectly! 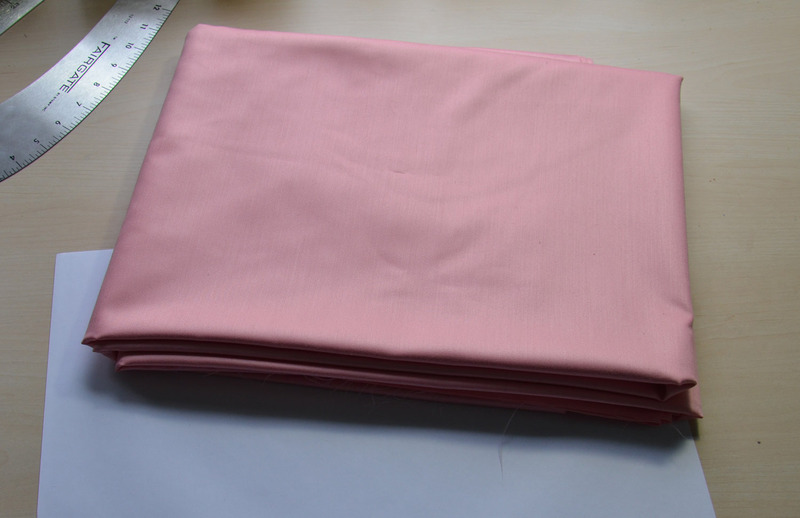 I bought five yards of the twill in pink too. 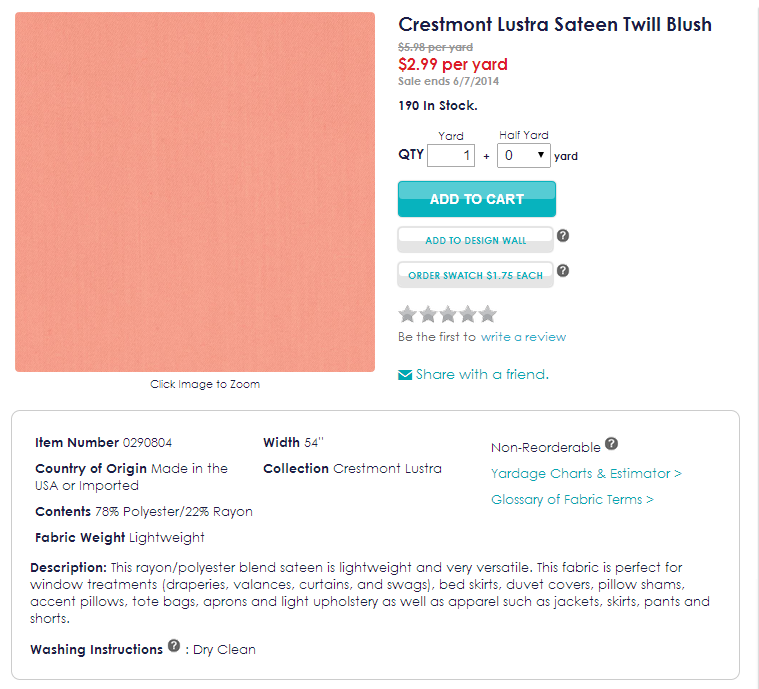 I regretted this right after the order went through because I realized I would probably end up with a pile of pepto bismol like fabric (blush probably means hot pink by fabric.com standards). I bought five yards – I figured it would make a nice early 1900’s dress, and if it was awful, I could use it to construct a giant ruffly petticoat. Like the cornhusk material, it’s very different in color then the online photos – but it’s really pretty too! It’s not the peach color I had hoped it would be, but It’s a lovely cool toned light pink, which manages to look bright and cheery but not overwhelming. 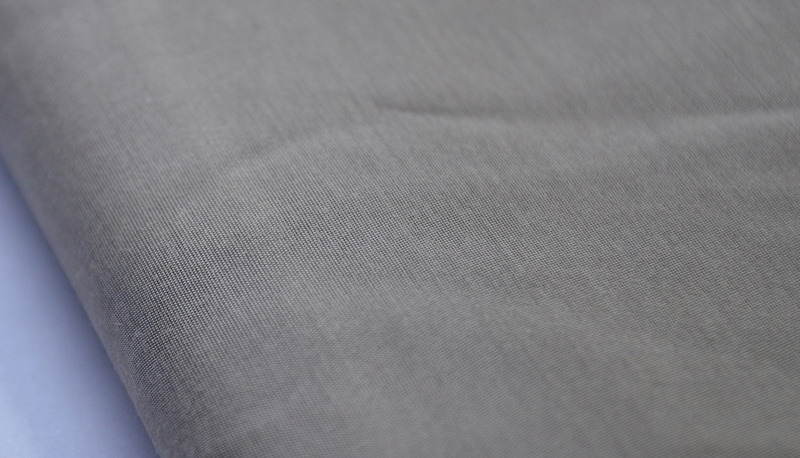 Again it has the twill texture and a nice sheen to it. After I took this out of the package I found myself regretting that I didn’t buy more. 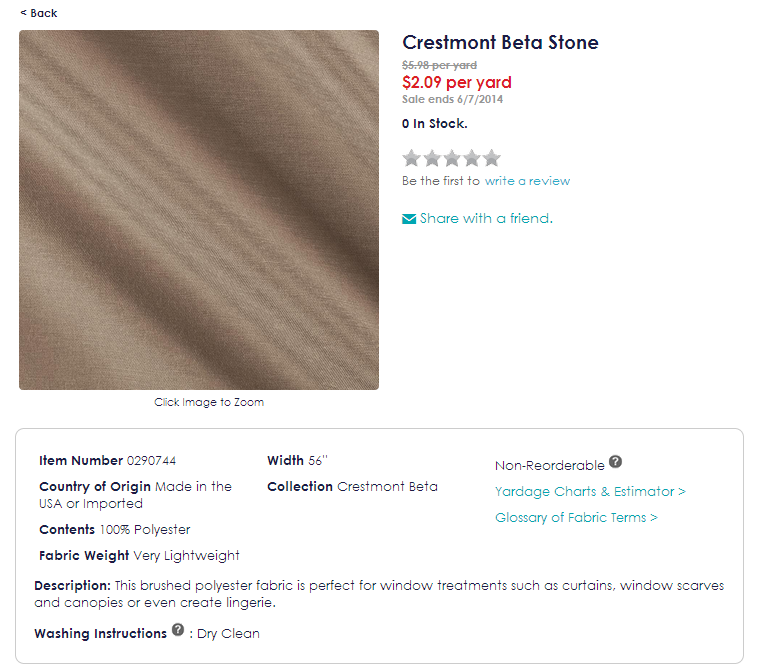 I was kind of clueless what this would be like (it’s suggested to be used to make window sheers and lingerie) I thought it may be sheer like chiffon but I wasn’t sure. I purchased it mostly because I liked the color, it’s really different from the colors I usually go for, and more interesting then ivory. I bought three yards of this. It’s not sheer, at all. I’d describe the appearance as a double sided satin with a little less sheen. But it feels like silk – so soft and pretty. The color is a little different, instead of being brown toned, it’s more of a greenish colored khaki. 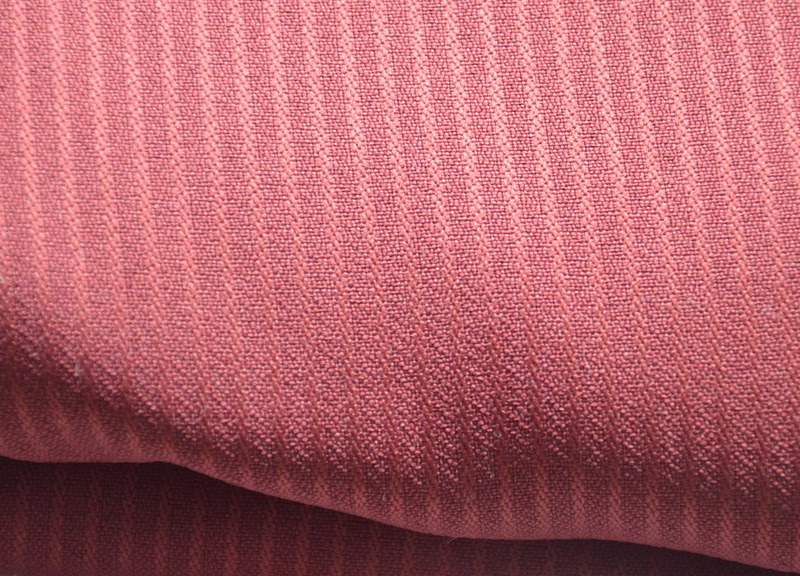 I really dislike the color, but it does feel and look really nice – sadly it will probably end up as lining material. Moving on to the final fabric from the “Crestmont” series. I wasn’t quite sure what to expect form this one either, but the color drew me in. It was cheap and in my favorite shade of dark red, so I really couldn’t say no. I bought six yards of this. In real life it’s more of a brick red then I had expected. I’m slightly disappointed but I still like the color a lot. The fabric itself feels quite nubby and flimsy, like really cheap polyester suiting . The print adds texture but is still relatively subtle. The fabric really does feel awful, but I think I can make something pretty out of it anyway. I’m not sure what yet, but it will be used eventually. 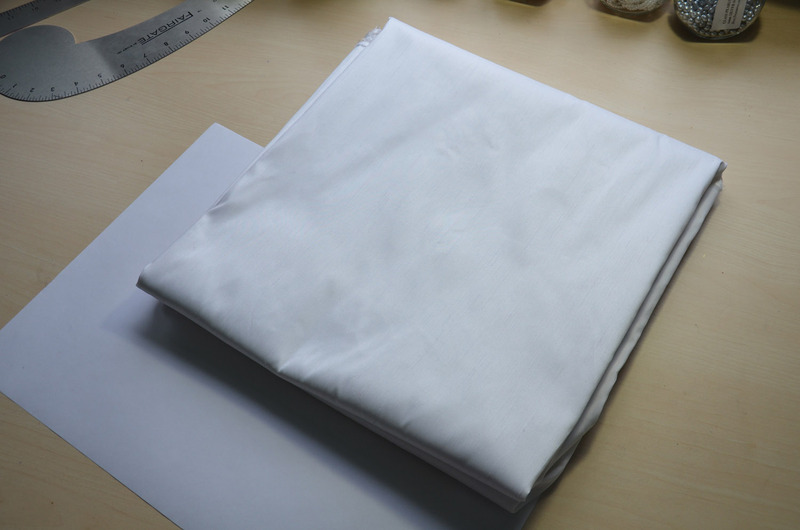 I snagged some white shantung which i’m really happy about. It’s such an easy fabric to work with and I love the weight of it (stiff but not heavy – amazing for full length dresses) and although it’s not the traditional material, I picked this up with a chemise a la reine in mind. 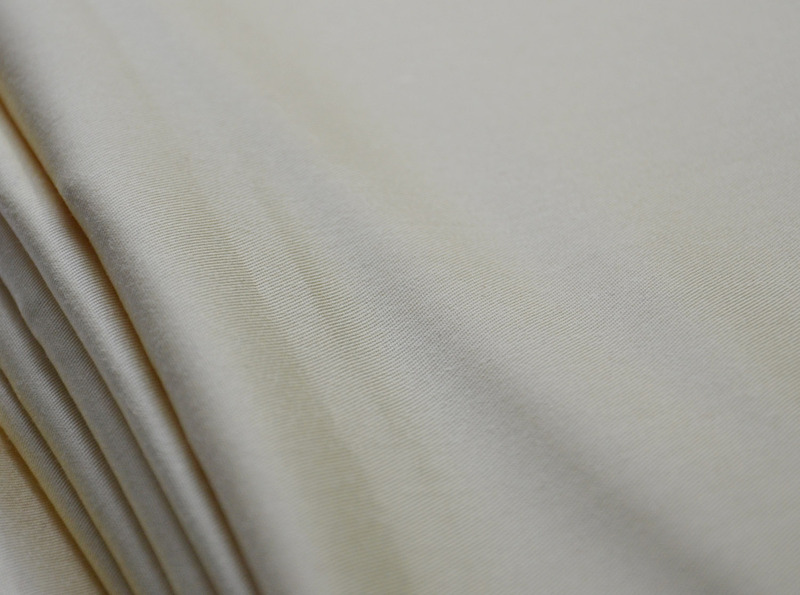 It’s the stiffest shantung i’ve ever felt, so I wouldn’t consider it “very lightweight” nor would I use this for bedding or regular apparel. But it does look very nice! It’s a bright white with a pretty, subtle sheen. The slub is obvious up close, but not very visible from far away. 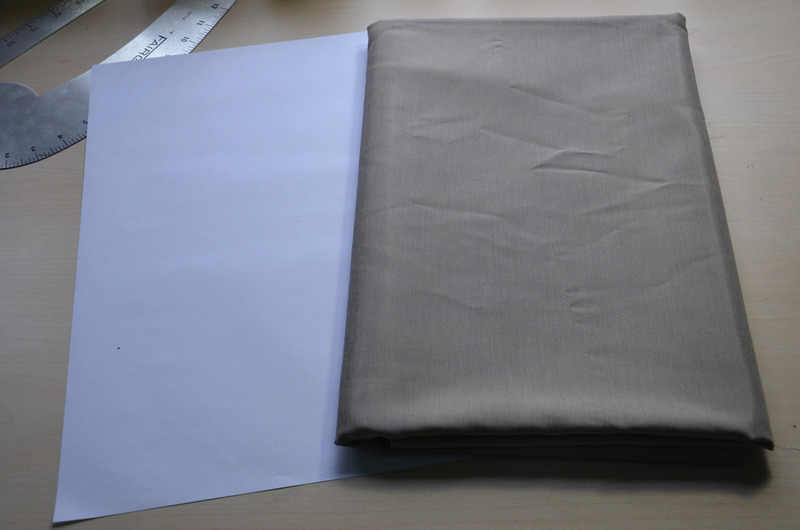 Nice if you are like me and don’t care for large slub, not so nice if you are looking for an accurate “dupe” for silk shantung. 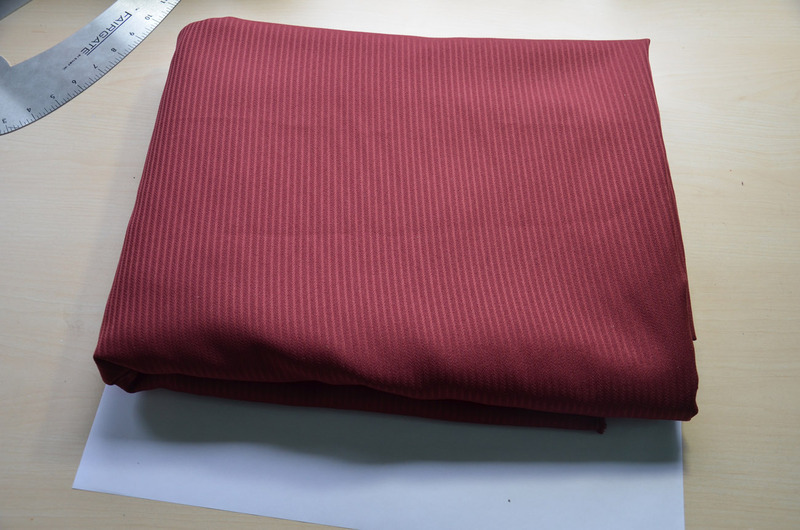 This fabric was the one that frustrated me the most out of the bunch, since I can’t use it for anything really. I bought it because when I saw it I instantly thought of pirates – and i’m a sucker for pirates. Luckily I only wasted money on one yard, though. 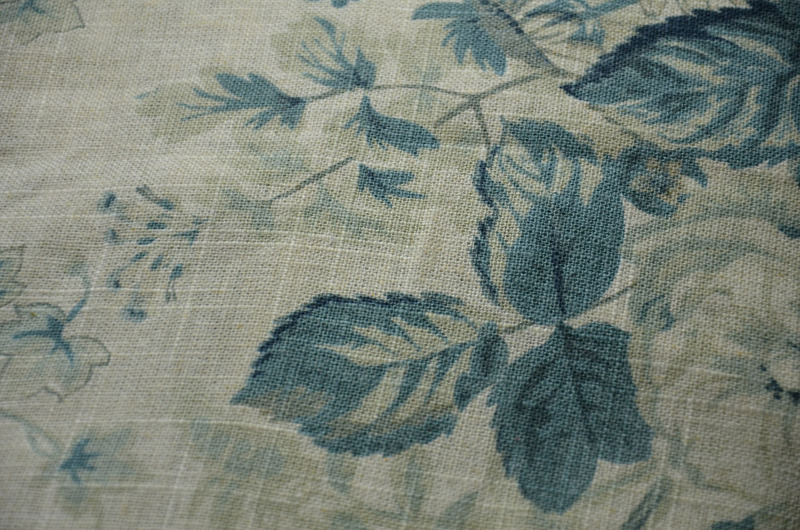 The problem with this fabric is that [unlike the photo shown] the pattern is situated vertically instead of horizontally. 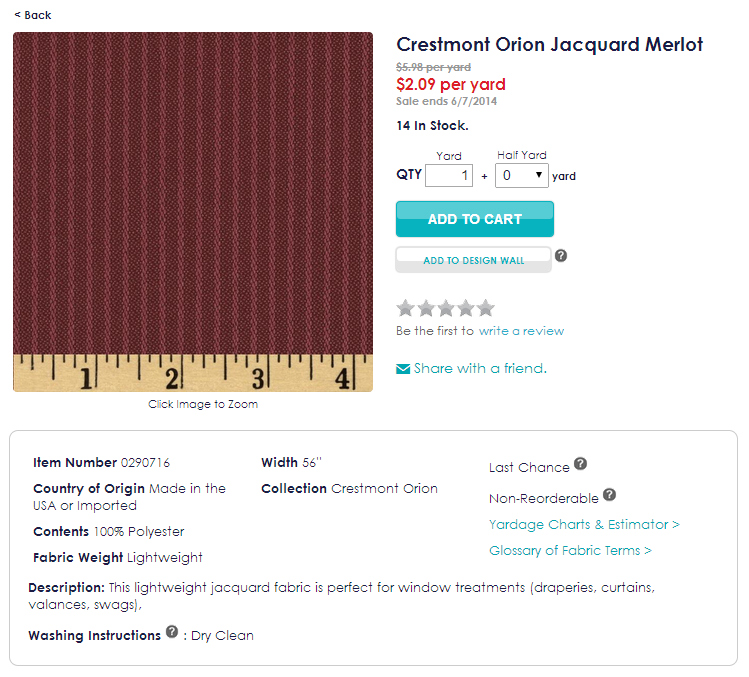 I guess this makes sense if you are purchasing it for drapery, since then you can have the length longer then 54″ without having a seam. But I went off of the photo and assumed it would be oriented horizontally, so I could make a skirt from it. That isn’t the case, so it won’t really work for a skirt unless I want it to be quite short. I do like the fabric print a lot. It looks aged, almost like a map, and the ships and still reminds me of something piratey. 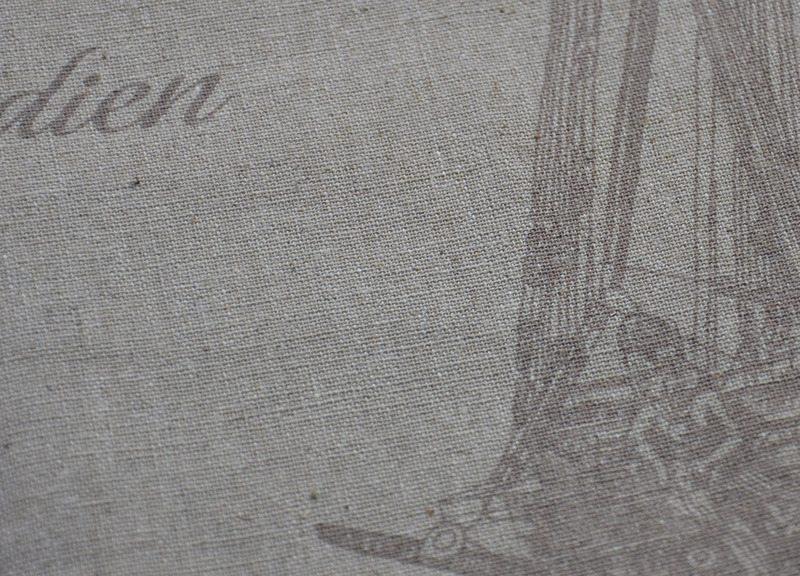 It looks almost like burlap, but it feels like a very heavy linen. I think I will eventually make a (grumble) shorter skirt out of it. But for now it’s tucked away. I’ll pull it out on a rainy day when i’m fed up with all my other projects. And the cotton backing mentioned in the description. I saved my favorite for last! This fabric is one I bought with something very specific in mind, so I had higher expectations then I did with the rest of the materials. 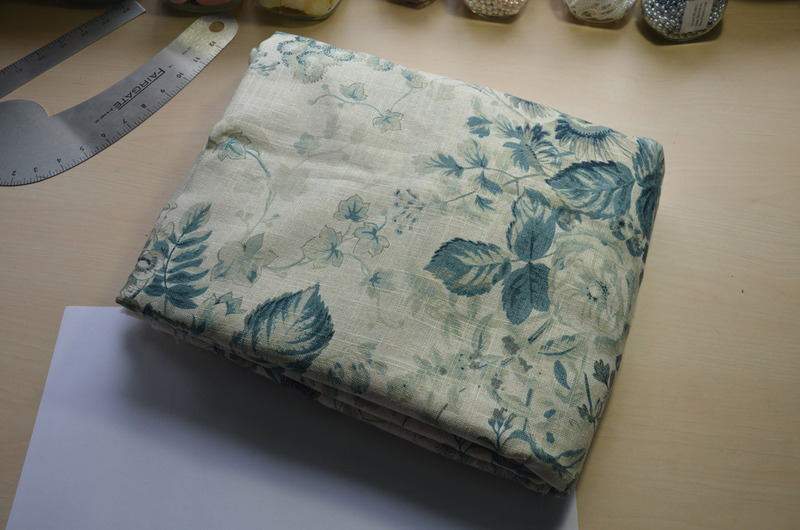 The fabric feels like regular linen and the print looks like an oil painting. I don’t see much teal in it – it’s more like a true porcelain blue in my opinion, but I guess other people may feel differently. Either way I really love the print, color, and texture of this fabric. A year ago I probably would have thought this fabric was hideous – funny how tastes change. So that was that! I’m happy with almost everything I got. As usual the photos aren’t very accurate to what you end up with, but this time around I wasn’t too bothered by the differences. 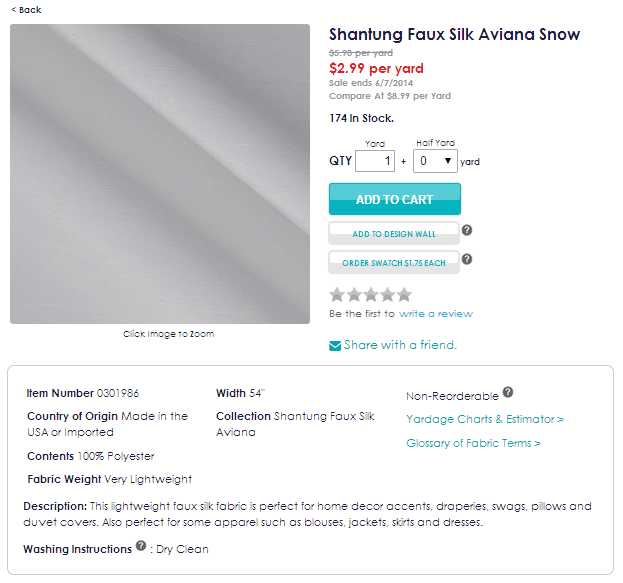 Make of this what you will – but in my experiences fabric quality varies a lot. The photos and product descriptions [usually] aren’t super accurate, so you can’t really be sure what you’re getting unless you buy a swatch first. 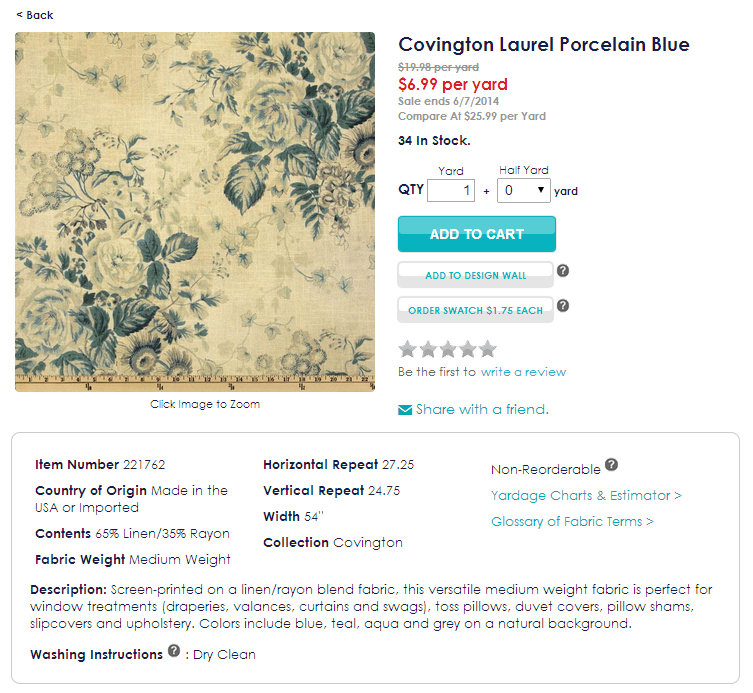 Customer service is pretty awful – there has always been something wrong with every order I have made, and the fabric.com staff has never done anything to help resolve the issues – even when they are responsible for them. I’ve been really frustrated with them many times, and I bet I will be frustrated with them again in the future. Fabric.com is NOT the first place I go for material, it never will be, but I do enjoy taking advantage or the amazing sales they occasionally put out. Sleeve post should be up tomorrow! Sorry for the delay, my brother and father have been home all week so its been a bit chaotic – I haven’t had my quiet time in the morning blog. I was really interested to read your posts about Fabric.com, because I placed an order with them and had problems, too. For some reason, my order was held because of a supposed address problem. I called them, but they could not identify what exactly the problem was. We verified that the address they had was correct. But in 10 days when nothing had arrived, I called again. Same problem. Finally I had to get upset with them and told them I expected them to hand hold the order through every step and get it out the door. They finally did, and sent me a tracking number. I got my order exactly one month after first placing it. But there are no guarantees that this won’t happen again. The fabric? Meh. I have used most of it, but it think other sources are preferable. 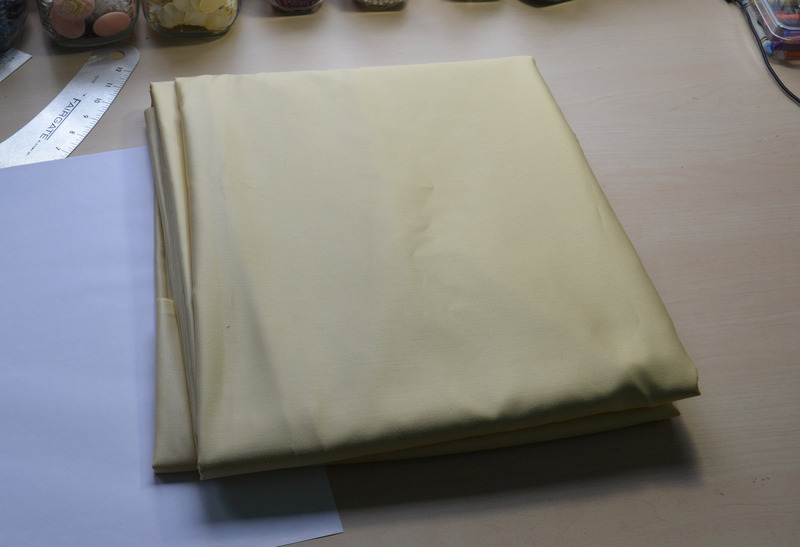 I had ordered from them before with varying results, but what stopped me from ordering was when I ordered 20 yards of “shimmer” fabric, which looked to have a metallic print on it. When it arrived it was nice enough, so I washed it before cutting (so it would pre-shrink) and the metallic came off like glitter. I was covered in metallic bits. Because it had been washed, they would not accept the fabric back. Considering I washed it according to their recommendations and it was their fabric that was faulty, I expected them to take it back. I wound up tossing it out because I couldn’t get it to stop shedding glitter everywhere. I have had better luck with Fashion Fabrics Club. I hope you have better luck in the future! My first and last order with fabric.com took over 3 weeks, 19 emails, and a phone call to get 80% correct. Some of the fabrics were quite nice but I have 3 yards of fabric I intended for a dress that is now a lifetime supply of pot scrubbies. The second item they informed me was out of stock they also said had mysteriously gone on sale sometime between when I ordered it and when they fulfilled the order, and they would only allow me the sale price in replacement fabric despite charging me the non-sale price. When my order arrived one of the several replacements I had been required to make was missing. When I emailed them about it they replied that yes, it was not put in the box and that they had refunded the amount. They included extra yardage of one of the other replacement fabrics, charging me for it. Never again. 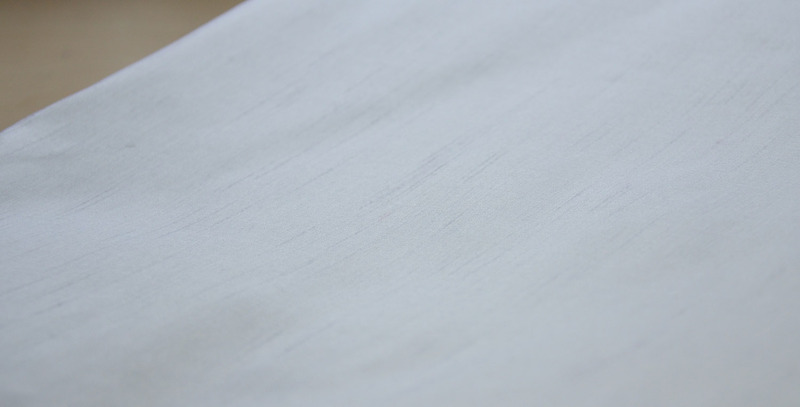 Looking for translucent white on white curtain fabric.extra wide ..
Great post. 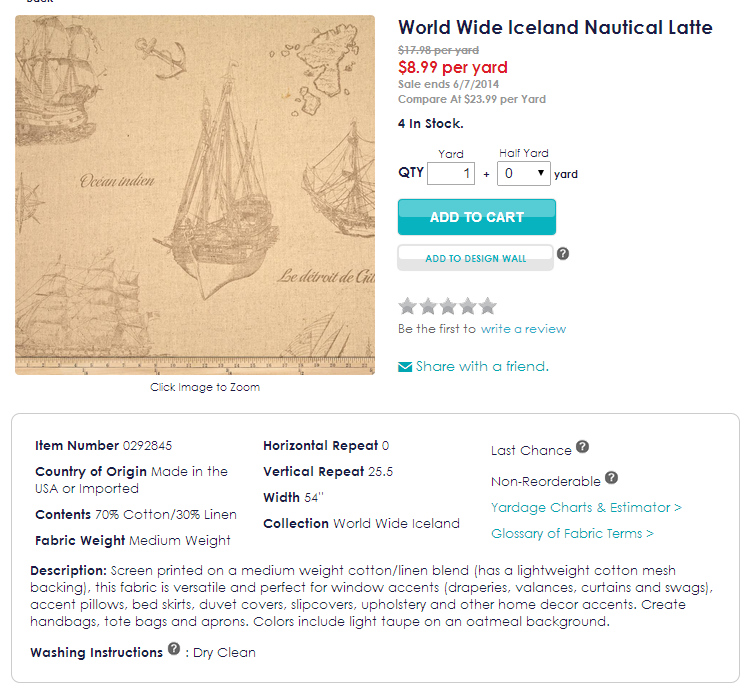 I almost ordered from fabric.com. 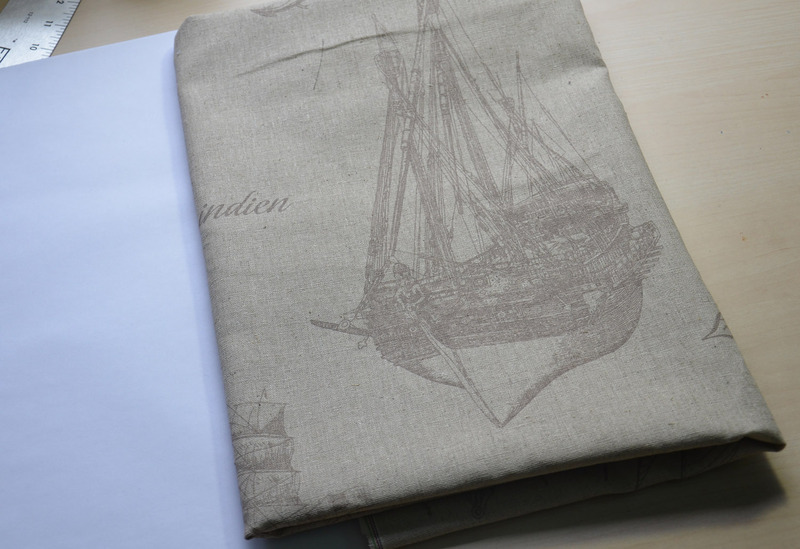 You made the comment that it was not your first choice for fabric, can you please share with us your top online sites?